, an illustrious philosopher of the school of the stoics, flourished in the first century of the Christian aera. He was born at Hieropolis in Phrygia, and was sold as a slave to Epaphroditus, one of Nero’s domestics. He was lame, which has been variously accounted for. 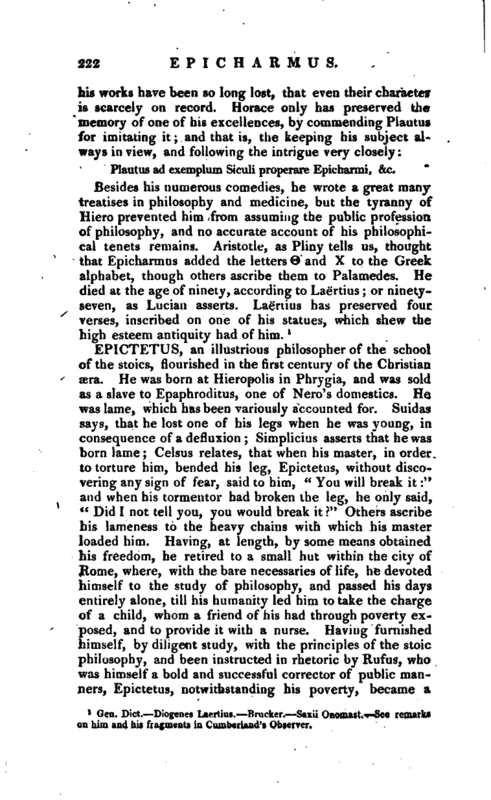 Suidas says, that he lost one of his legs when he was young, in consequence of a defluxion; Simplicius asserts that he was born lame; Celsus relates, that when his master, in order to torture him, bended his leg, Epictetus, without discovering any sign of fear, said to him, “You will break it:” and when his tormentor had broken the leg, he only said, “Did I not tell you, you would break it?” Others ascribe his lameness to the heavy chains with which his master loaded him. Having, at length, by some means obtained his freedom, he retired to a small hut within the city of Rome, where, with the bare necessaries of life, he devoted himself to the study of philosophy, and passed his days entirely alone, till his humanity led him to take the charge of a child, whom a friend of his had through poverty exposed, and to provide it with a nurse. 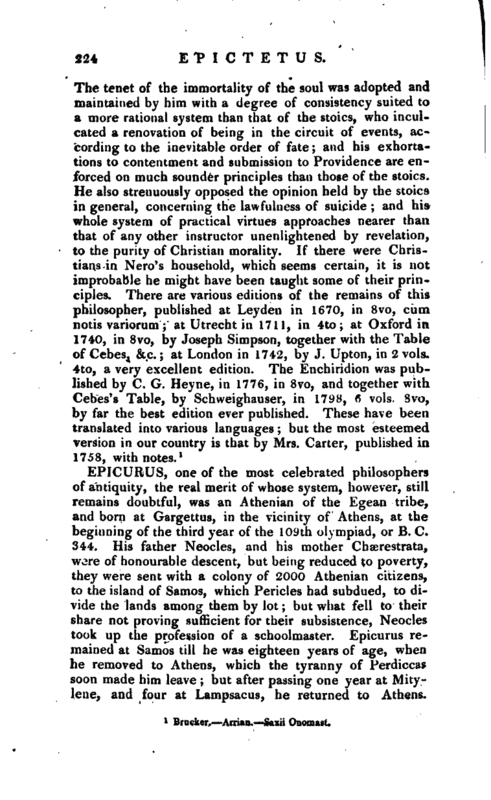 Having furnished himself, by diligent study, with the principles of the stoic philosophy, and been instructed in rhetoric by Rufus, who was himself a bold and successlul corrector of public manners, Epictetus, notwithstanding his poverty, became a | popular moral preceptor, for which he was admirably qualified, being an acute and judicious observer of manners. His eloquence was simple, majestic, nervous, and penetrating, and while his doctrine inculcated the purest morals, his life was an admirable pattern of sobriety, magnanimity, and the most rigid virtue. Neither his humble station, nor his singular merit, could however screen Epictetus from the tyranny of the monster Domitian. With the rest of the philosophers he was banished, under a mock decree of the senate, from Italy, which he bore with a degree of firmness worthy of a philosopher who called himself a citizen of the world, and could boast that, wherever he went, he carried his best treasures along with him. At Nicopolis, the place which he chose for his residence, he prosecuted his design of correcting viceand folly by the precepts of philosophy. Wherever he could obtain an auditory, he discoursed concerning the true way of attaining contentment and happiness; and the wisdom and eloquence of his discourses were so highly admired, that it became a common practice among the more studious of his - hearers to commit them to writing. 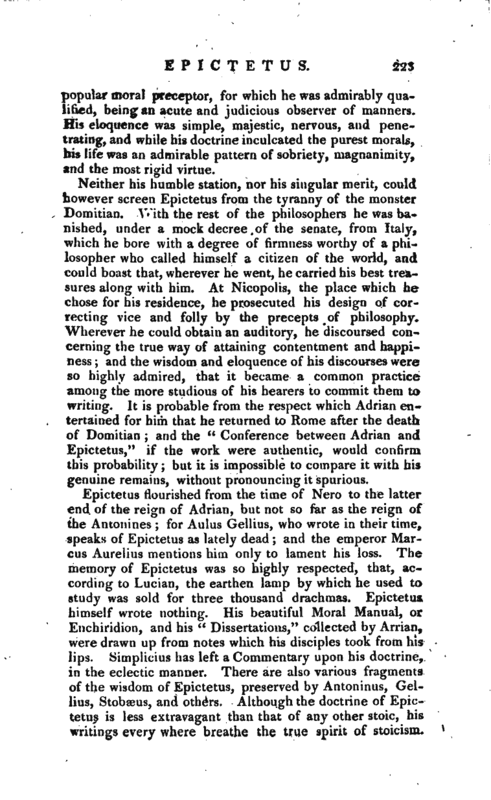 It is probable from the respect which Adrian entertained for him that he returned to Rome after the death of Domitian; and the “Conference between Adrian and Epictetus,” if the work were authentic, would confirm this probability; but it is impossible to compare it with his genuine remains, without pronouncing it spurious.